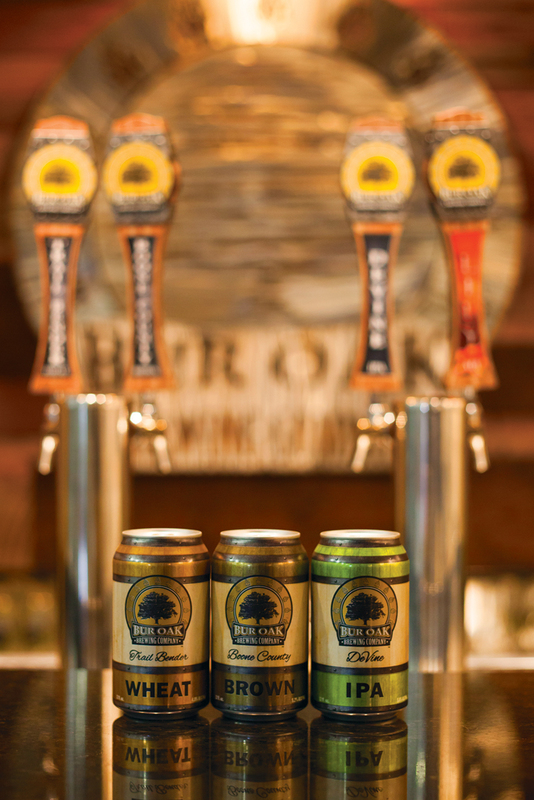 “My love affair with craft beer was sparked in Tampa,” Craig Sticher, Founder and President of Bur Oak Brewing Company, expresses nostalgically. But Craig’s exposure to these new beers was short-lived. In the late 90s, he moved to Central Michigan to finish school, where, sadly, there was an extreme shortage of craft beer. “It was a bit of a necessity to brew my own [beer],” says Craig, “so that’s how I ended up home brewing.” And his brewing went wild for 10-14 years, eventually developing into the creation of Bur Oak Brewing Company. Craig loved his previous job at Mizzou, utilizing his mechanical engineering education as the Mizzou Facilities Manager, and enjoyed the benefit of meeting new, interesting people the job afforded him, but he was missing a creative outlet. What that outlet was, Craig wasn’t yet sure, but he believed it involved a small business. Working with the MU Extension for Small Businesses, Craig took small business classes to learn the how and the what. “Go big, or go home,” says a smiling Craig. 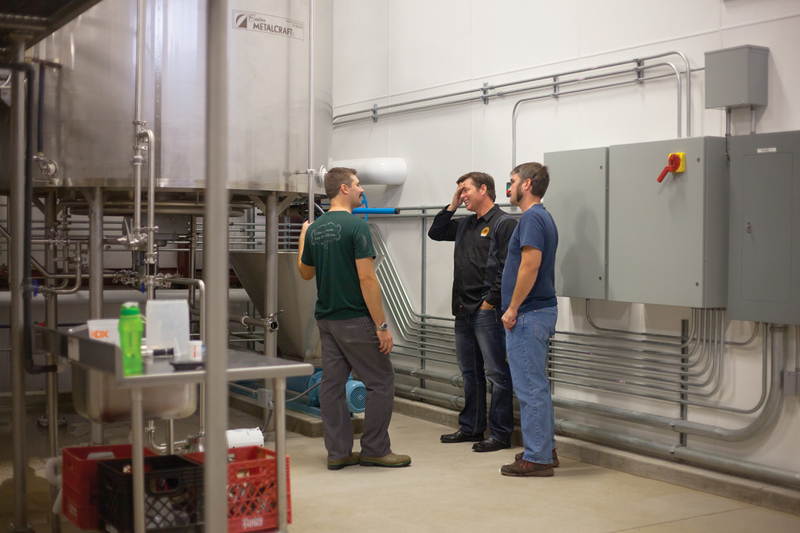 “Build a brewery destined to be a regional brewery, not just local.” And gone big they have. In March 2014, Bur Oak created their first batch, started selling in May from their tasting room, and soon started hitting the taps at bars and restaurants. After a mere 6 months, their product is in cans. While Bur Oak beers are delicious, dependable and true to their style, what makes Bur Oak special is actually who makes the beer. Kraig Bridgeford is not your typical basement beer brewer. He has a diploma from the London Institute of Brewing and Distilling and has been brewing professionally for a decade. “He brings a high standard to our beer for the betterment of our customers,” says Craig, proudly. “We needed a brewery cat,” explains Craig. So, to the Central Missouri Humane Society the guys went. Of course the guys were afraid Clyde would run away, as often they leave the brewery’s giant rolling back door open. But he stayed. 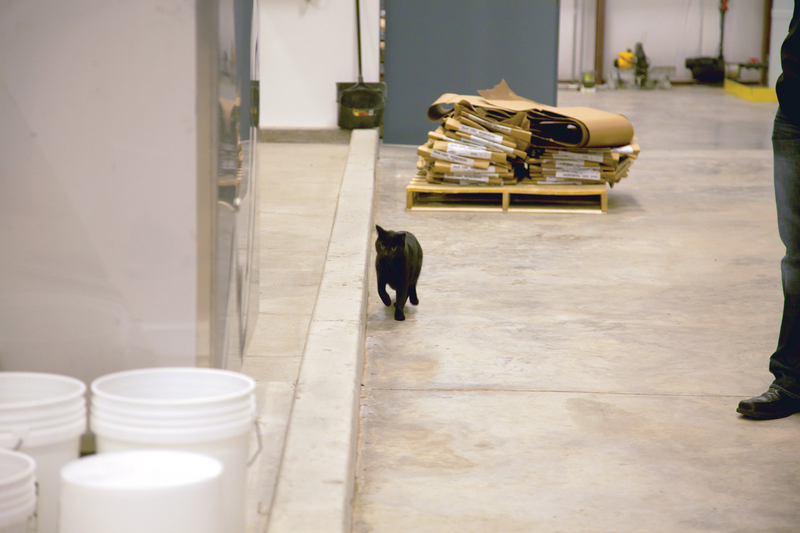 Occasionally, Clyde is accidentally locked out of the brewery, but the fearless black cat is always hanging around the door when someone returns. He is officially the fourth member of the Bur Oak team. As far as the beer is concerned, Bur Oak brews honestly. 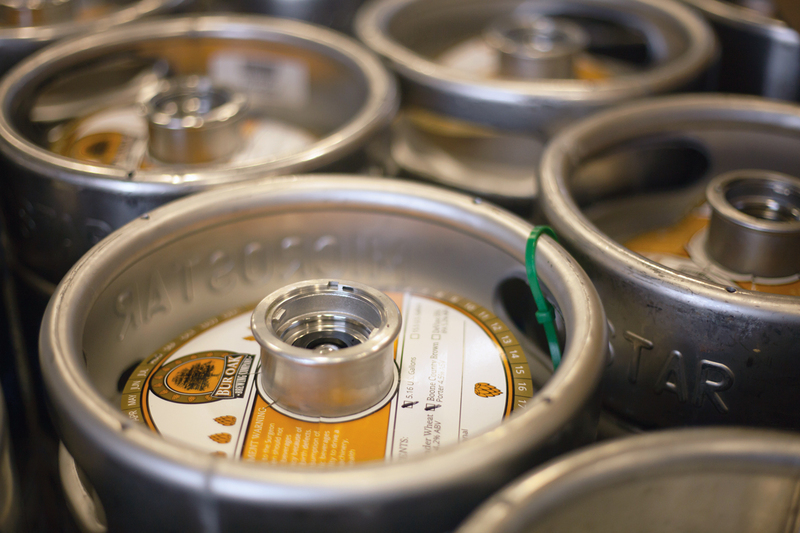 Craig looks to traditions set by Boulevard Brewing Company founder, John McDonald. Because beer drinkers have a preconceived notion of what a beer style is, they can look to Bur Oak beers and know it’s going to be what they expect. While they typically follow their closely-calculated recipes, they do tinker around with flavors and ingredients. Their current special brew, Lily, was a collective experiment with downtown Columbia’s custom fragrance shop, Makes Scents. Makes Scents brought the building blocks to what Lily has become, helping to select the incorporated flavors of orange, raspberry and lavender. What came out is a subtle fruity and fragrant yet highly-drinkable beer that has found its calling with wine and cocktail drinkers, bringing a whole demographic over to craft beer. Along with Lily, the guys at Bur Oak have been toying with a holiday spiced hefeweizen and an oak-aged brown with notes of oak and vanilla, but their previous, now perfected Sacred Sun Saison and Lily are planning to hit stores Spring 2015. Continuing on the track to being a regional brewery, Bur Oak is spreading outside Central Missouri, with cans being sold in fine grocery stores in Kansas City. Bur Oak has not broken into the St. Louis scene just yet, but there are hopes to be on the market by the end of 2014. 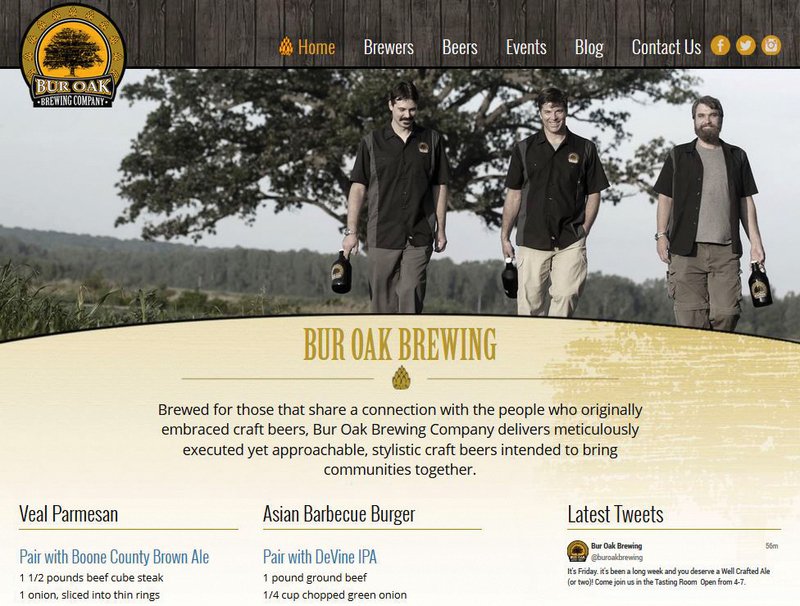 Growing publicly, the Bur Oak guys realized they needed to do something about their existing website. Craig came to MayeCreate with the typical story. “People were starting to ask questions about ‘Who is this Bur Oak?’ searching and finding our website with three ‘under construction’ pages that hadn’t progressed for the previous ten months!” exclaims Craig. Bob Gerding of the Community Foundation of Central Missouri, with whom Craig has worked, was aware of the unfortunate state of the existing Bur Oak website and mentioned MayeCreate’s work with CFCM on the CoMoGives donation campaign website. Craig immediately called MayeCreate and began the website development journey with Stacy Brockmeier, MayeCreate’s New Business Developer. The initial creative meeting with MayeCreate afforded Craig some time to spend viewing various existing websites discerning what features he liked and why, cultivating a plan of action for his own site. Initially, Craig may not have known how he wanted the website to look, but MayeCreate did…and the results? After confirming you’re of legal age to view this beer greatness, visitors are greeted with a lovely, curved slideshow rotating fantastic photography that ranges from the Bur Oak guys hanging at the famous McBaine oak tree to happy Bur Oak beer drinkers. It’s not uncommon for the Bur Oak guys to be asked the symbolism behind the McBaine oak tree; the Bur Oak trademark. December 13th Bur Oak will be participating in a festival hosted by the Czechoslovakian Cultural Group where local, Missouri breweries will be pouring next to Czechoslovakian breweries. Proceeds will be donated to their local youth gymnastic program.